In my opinion the worst part of any job is the cleanup. There is no exception, even in a labor of love. To make a simple rip cut requires much disassembly of my table saw’s “homeless shelter”. I now have 2 tarps and a portable tent guarding my saw from the elements. While the temperature and humidity are relatively the same in the shed, the rain and snow we’ve had do compromise the saw. I now hear “rust” when it rains. 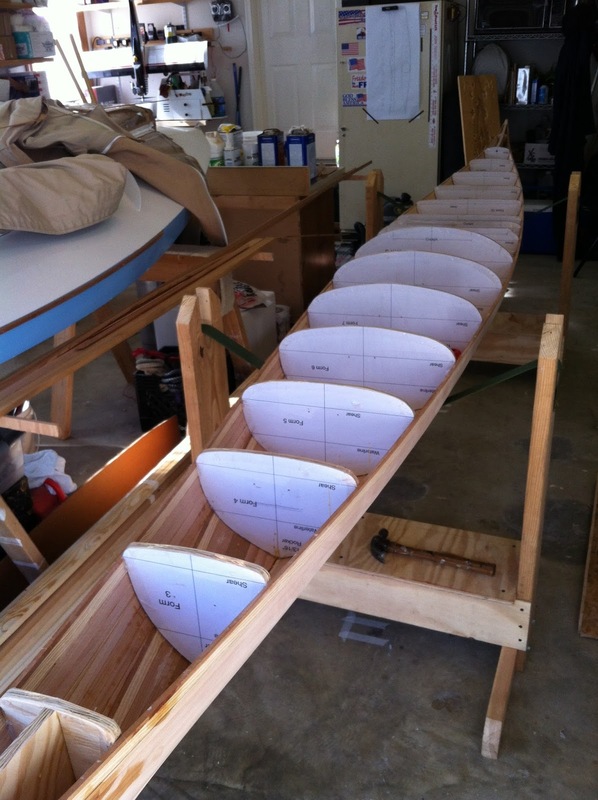 The shed is too short for kayak lumber. I’ve considered putting a window in the end opposite the door to accommodate long boards. Hopefully we can put the table saw back in her home in a week. I hope to have all the strips for the deck in place soon. having to uncover and then cover with each use has been an excuse not to work. Nonetheless, the robes came off the saw yesterday and the decking began. It feels good to be moving on the project again. 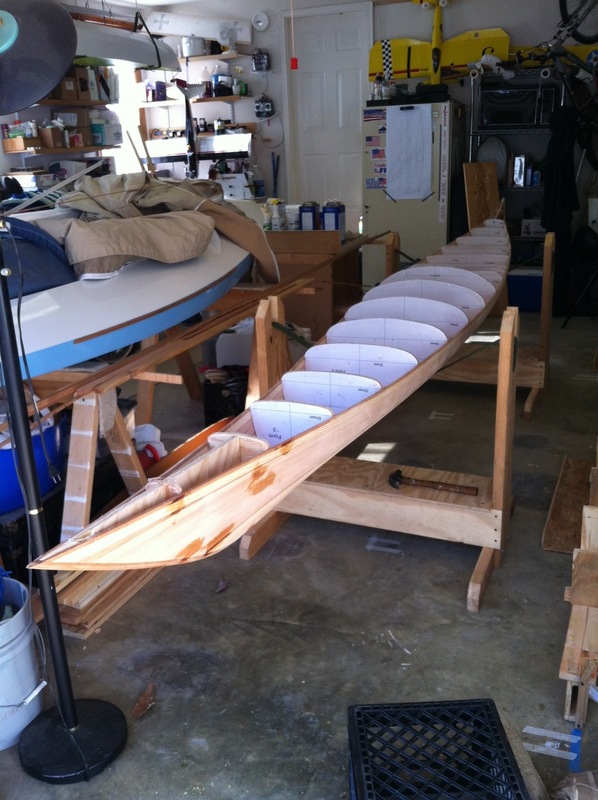 I elected to forgo glassing now, glue the forms back on the hull, unscrew it from the strongback, and cradle it all between slings nailed to the sawhorses. You can see the sweet flow of the deck now. “Schmutz” patches on the bow. I had some concern that I had a couple flat places in the hull along the shear where the strips were pulled too tightly, primarily just aft of the cockpit. Thankfully, those seem to have smoothed themselves out once the hull was released from the forms. However, I had hot melted the hull back on all but the stem forms and apparently missed the keel alignment by 1/8″. So, I broke the middle 6-8 forms out and repositioned. This also gave me the opportunity to examine the joints in the strips on the interior. With a few exceptions in the bow and stern which need some of what Nick Schade calls “dookie schmutz”, they all looked pretty good. I’ll list his book(s) and other resources at some point. aside from the wondrous online knowledge, there are some very well illustrated expert sources. Nick also has a number of YouTube videos that are instructive too. Not pictured are the few strips I’ve added to the deck. the shear is a real tight bend and I ripped the typical 3/4″ strip in half with a bevelled cut for 2 usable strips. This is likely the toughest part of the boat as these shear strips twist quite a bit fore and aft requiring patient hand planing for a proper snug fit to the hull and each other. Now that I have some of the technique down it is fun. Lastly, I had considered making 3 cradles to support the hull back in the strongback as the height in the slings is back breaking, but a chair is working for now. Once sanding is needed, I think I’ll resort to forms. We’ll see. It may be a diversion at some point and simple to set up.